This list is constantly changing, with billionaire and celebrity owners alike changing their minds and their taste like you and I change the bedsheets. 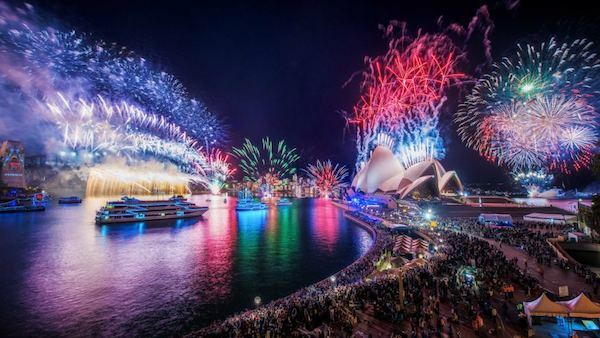 With this in mind, and because here at Any Boat we love expensive boats and celebrity gossip as much as the next person we have compiled a list of ten stupidly expensive Superyachts and their equally stupid, famous! .. I mean famous celebrity owners. 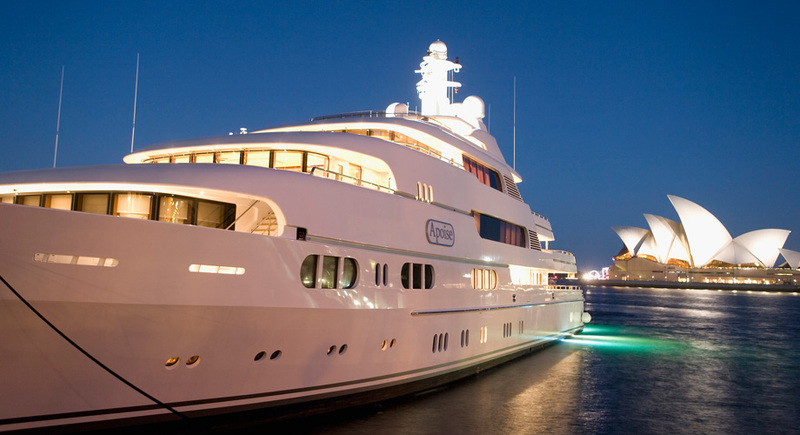 Top Ten Most Impressive Superyachts and Their Rich and Famous Owners. Although this power couple has yet to purchase a yacht of their own, they are no strangers to renting the best superyachts on the water. Their last adventure cost them $377,000 for one week at sea. Altitude has six cabins that can accommodate up to 12 guests during a single trip. This superyacht also has a dedicated water sports boat with an outboard motor, two wave runners, a catamaran, one sailing dinghy, a 15 foot water trampoline, fishing equipment and snorkeling equipment. And just in case that isn't enough to tire you out, Altitude has it's own private gym equipped with a spinning bike, cross trainer, running machine, and weights. Altitude has three spacious aft decks with lots of open seating, lounging and dining areas. And just in case the paparazzi show up, Beyoncé and Jay-Z can retreat to their split-level owner's suite, complete with his and hers bathrooms, an observation lounge, and study. 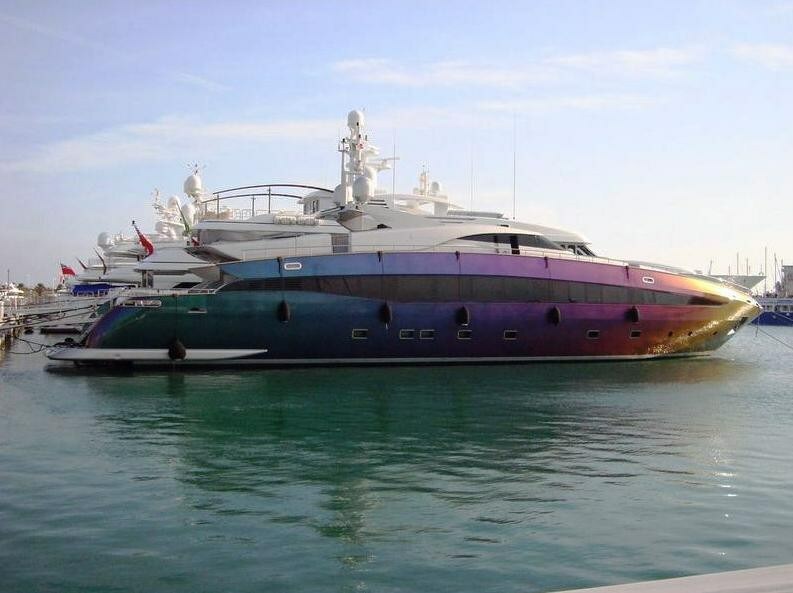 Giorgio Armani the fashion designer owns this 213' superyacht that cost him just shy of $60million USD to build. I am not sure what the name means or where it comes from, but Giorgio Armani actually owns another two smaller superyachts so this author assumes he ran out of ideas and kept forgetting what the biggest (main) boat was. It took 30 months to build at Italy's prestigious Codecasa shipyards and cost him more than $60 million (USD) in final production cost. The interiors are dressed in his favorite suit shades of gray and beige, set off with light birchwood floors and blinds, and dark-green lacquered walls that match the hull. The rigorous Armani pen is everywhere, from the patterned silk wall coverings and Armani Casa furniture in the staterooms to the underbelly of the boat, where the engines are white and spotless and four washing machines are stacked neatly across from four dryers in the laundry room. Aside from parties, the yacht also hosts photo shoots for various high fashion magazines. It seems I missed my calling and should have trained as a fashion designer!? First Giorgio and then Dolce & Gabbana and now Robert Cavalli?! Fashion designer Roberto Cavalli from Florence, Italy is well-known for his exotic printed designs. 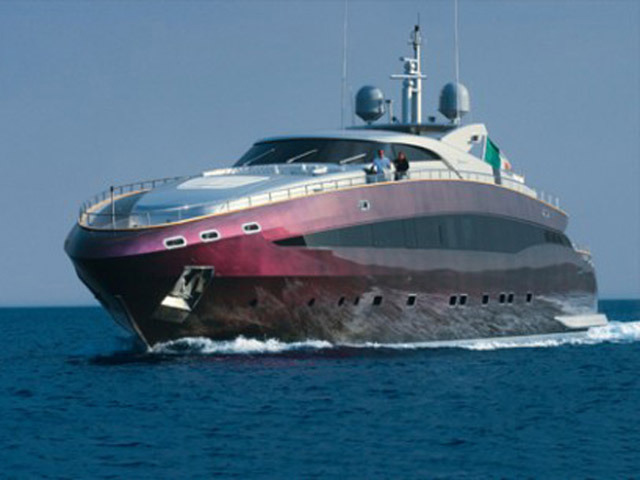 His yacht named Baglietto clearly shows Cavalli’s influence in designing. This 41-meter long yacht has a distinctive eye-catcher combination of color that you can immediately notice even if the yacht is a quite distance away. Named after himself and measuring 42 metres in length, this Baglietto built superyacht has 15rooms and spends its life hosting lavish parties held by the fashion designer and his high class friends. Our first real celebrity, Johnny Depps' Gorgeous sailing vessel is probably one of the smallest superyachts on this list and yet is without doubt one of the nicest. The yacht was built by Proteksan Turquoise in Turkey and is considered to be a modern classic superyacht. It measures 47 meters long and the name of Vajoliroja is a combination of the names in Depp’s family. “Va” is his ex-girlfriend Vanessa Paradis, “jo” is for the actor, “liro” is for his daughter Lily Rose and “ja” is for his son Jack. 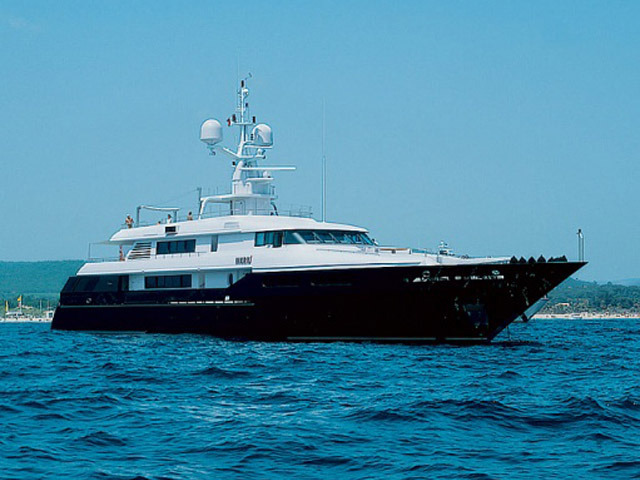 Priced at $33 million, this yacht accommodates up to ten guests and has a crew of eight. There is a formal dining room, library, outdoor seating areas, master suite, and four cabins for guests. In the toy department, there are tenders, kayaks, windsurfers, water-skis, wake board, and snorkel gear. This Superyacht is like watching one of his many movies....Amazing, breathtaking and impressive from every angle! 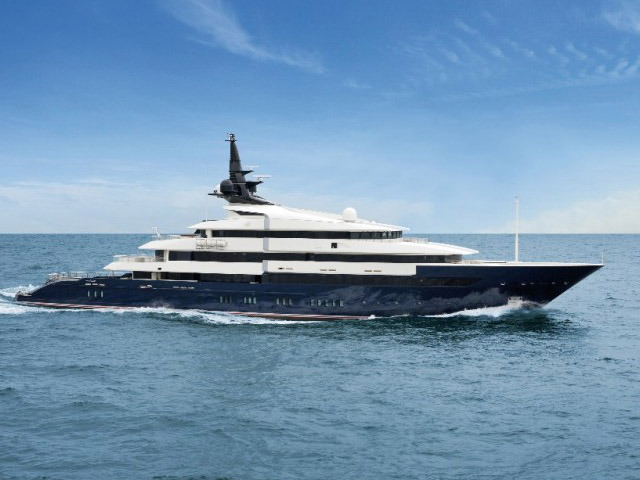 The acclaimed director Steven Spielberg is the owner of Seven Seas, an 86-meter yacht built by Oceanco from a design by the Nuvolari Lenard Design company. At 282 feet long, and priced at $200 million, it boasts luxury amenities for 12 guests and a crew of 26. There is a large master stateroom with a study and private deck, a helipad, indoor cinema, and an infinity pool with a 15-foot glass wall that converts to a movie screen so the director and his guests can take in a film while swimming. The interior is adorned in walnut, teak and rosewood. The Cayman Island-flagged vessel can travel at 20 knots, and a special stabilizing system in the hull reduces seasickness - something that even Steven himself can't escape from. 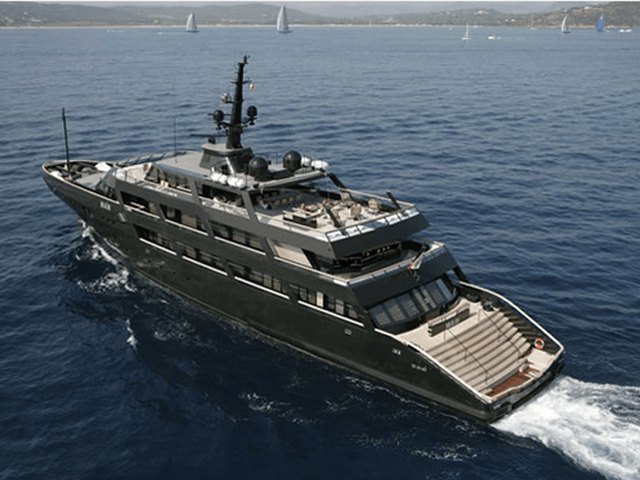 Measuring 155' in length and costing Tiger a cool 20 million, Privacy consists of a main deck where there is a large bar and a jacuzzi that can fit up to eight people. (oh TIger will you ever learn?! 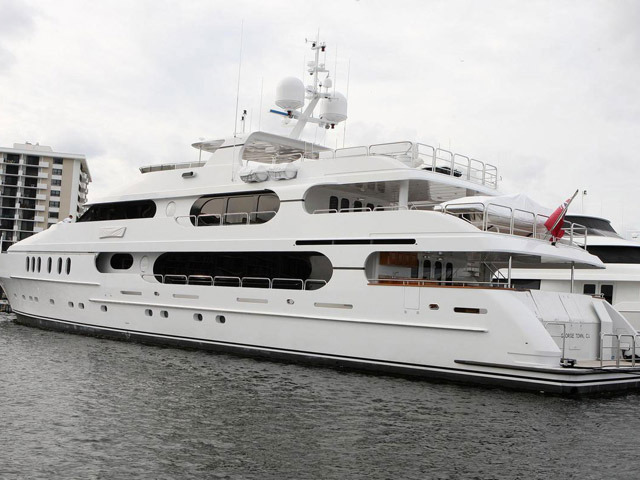 )The yacht also has a station to fill scuba tanks and an inflatable decompression chamber. The interior of the yacht is filled with cherry woodwork with the VIP stateroom boasting two queen size cabin rooms. There is also a personal gym complete with a treadmill, exercise bike, and free weights. The sweeping staircase has transparent stairs and a cherry handrail that leads to the main living area between the saloon and the dining room. But don't worry if your legs are feeling wobbly - just take the elevator!!? 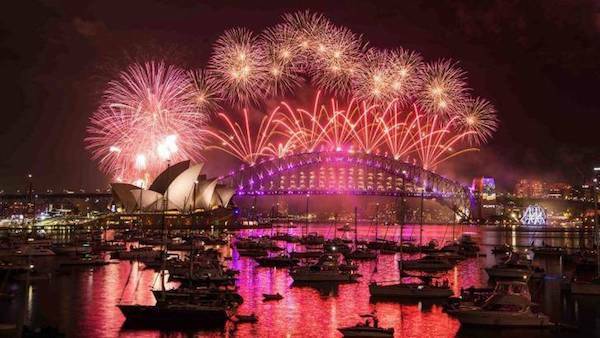 It measures 47 metres or 155' and can accommodate up to 12 guests as well. 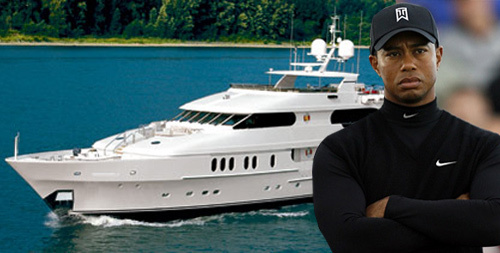 Sean "Diddy" Combs' owns one of the most expensive yachts. Coming in with a price tag of $65 million, this 54 metre (178') motor yacht , called The Maraya, is the the place to be when looking for some fun at sea. The yacht includes a top-deck party floor with bar, stage and projector screen. The living area features creamy leather sofas accented with pillows. Giant jars of dried apricots adorn the mantelpieces (Don't ask - its easier that way) and books about Africa are displayed on tables. Each deck comes with a private quarter behind sliding doors. There is also a 10-member staff on hand to maintain the ship, with duties that include the important task of baking chocolate chip cookies. Like the previous power couple Beyonce and Jay Z, Brad and Ang initially made this list as they chartered a superyacht whilst in Sydney. In fact they chartered one of our boats! They were seen cruising around in Australia in this boat, the Warren 87 Ghost .What a way to enjoy some fun at sea with the family on board. But Brad and Angelina didn't last long as non superyacht owners and soon joined the ranks of the elite - well actually they jumped straight to the top with this $323 Million superyacht!. Shortly after their wedding, the power duo spent over $323 million on a luxury yacht. These Hollywood newlyweds are said to have purchased the top-of-the-range ship built and designed by Razardi in Sabaudia,Italy - with plans to spend even more so that it fits their own specifications, including being decked out with Italian marble. According to the media, the yacht will have woodwork by Italian boat-makers Razzardi throughout the entire floating mansion. With six children, privacy is was key concern when purchasing the boat. The couple has plans to install technology to interfere with digital cameras and to stop the paparazzi from taking pictures of the family. Stay tuned for the next Superyachts and Celebrities installment where we take a look at the 10 most expensive celebrity owned superyachts.....something tells me we may be saying hello to Brad and Angelina again. 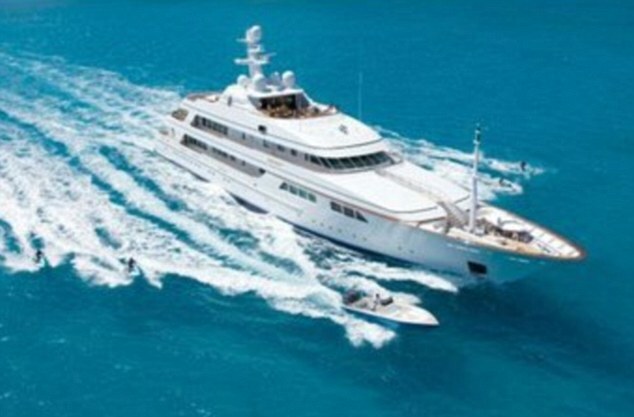 And checkout Any Boat's range of superyachts and luxury cruisers.